"Hi Welcome - Our beautiful London house is set in a safe upmarket neighbourhood, with a garden and free street parking right outside. The house has been totally renovated & refurbished and offers discerning guests a beautiful home where they can relax and enjoy their stay, surrounded by comfort and modern conveniences. The house has 3 super king bedrooms all with en suite bathrooms. A guest toilet is also available at ground floor. The house sleeps a maximum of 6 people with in addition to the 3 king bedrooms the option of a sofa bed in the sitting room. All linen is provided as well as towels, shampoo, soaps and shower gel. The house is centrally heated throughout, being warm in winter and cool in summer. A hospitality pack is provided upon arrival including, bread, milk, eggs, butter, biscuits and chocolates. -- Also coffee, tea, hot chocolate, sugar, olive oil, balsamic vinegar, salt, pepper are standard in the kitchen for each new arrival. The house is family friendly and great for children of all ages with a nice garden where they can safely play. Our terms for normal seasons are a minimum of 3 night stays however we will accept 2 night stays with a premium. We welcome pets but there is a strictly NO SMOKING rule in the house. The house is ideal for entertaining however no large parties are allowed and the house is limited to maximum of 8 non residential guests. The utility room has a washing machine and dryer. Laundry detergent and dishwasher tablets are provided. The kitchen leads onto a patio overlooking the spacious garden and array of beautiful flower beds. A full maid and or cleaning service is available upon request. Guests are requested to settle directly with the service staff for additional services. Close to good convenience shopping – 2 minutes from house. I was born in Central London and I know the City well, so if its your first time here or you want to know more I am happy to act as your Tour Guide. I will also be available during your stay should you require any other services, information or help to make your stay truly great. If you would like to chat or like to know anything else before you make the booking please send me an email. Please do not hesitate to ask me any query you may have. As all can see from other reviews, Robert’s home is a 5 Star vacation. We had 6 people, so everyone had a bedroom and separate bath, which was great. The house is as pictured, extremely nice and homey. The ease of train station across the street made all of our trips to central London easy. The lovely neighborhood had some stores for items needed, a nice breakfast cafe, and a Pub. Robert and family were there to greet us and give us a quick explanation of the neighborhood, the Oyster card, and other info. He also made available items such as coffee, tea, milk, bread. Such a great host and a great house. Thanks Robert for your hospitality. We stayed here with our pooches. Great for dogs and folk alike as the living room opens on to the kitchen which has french doors that open onto a fully enclosed garden. We had fantastic weather while we were there so we had the doors open pretty much the whole time. The kitchen was well equipped as well. Good location close to shopping and transportation links. Robert met us when we arrived and was extremely helpful. The place was clean and set up just as described. If you get an Oyster card, the above ground train leaves from literally across the street and is so convenient! We loved google maps ability to figure out the best train schedule for us. There is a great little area of shops with a coffe shop, market with fresh baked goods and wine shop as well as some great restaurants within walking distance. The home is located in an area where people live and doesn’t feel like a tourist trap. I would absolutely stay here again!!! The property was spacious and well located. Robert has done a great job making sure everything you need to “hit the ground running” is there for you. We would highly recommend this home for your stay in London. We were 4 adults and really enjoyed ourself here. The owner Robert was gracious enough to come in and have the house ready much earlier on the date of arrival as our flights came in early in the morning. He explained all the amenities and provided kitchen supplies to get us started. The home is a very well maintained cozy 3 bedroom townhome with a little backyard and very conveniently located to the attractions of central London. All bedrooms have attached full baths. A convenience store at about 200 ft away and more at a walking distance of 1/2 mile. The best bet is to take the E3 bus to turban green underground station and take the westbound district line to attractions like the tower, bridge, Westminster. One change and you can get to the shopping districts, Hyde park, museums etc. if you take the east bound district line and get off the next stop, you get connections to Harry Potter studios at Watford Junction. If you take the eastbound to Ealing broadway you get connections to Windsor castle. Overall a great experience and would highly recommend especially if you have a family with kids. We have stayed at many properties and everyone in our party agreed this was the best. Robert's communication with us about our stay was great. After meeting with him for our arrival we all wanted him to take the week off and join our vacation. The location of the house was great. Train and bus were across the street and we only ever waited 3-4 minutes for an Uber if needed. The house was perfect with very comfortable beds. It was also great that he provided some basics for breakfast in the morning. Should we take another trip to London, we will be staying here for sure. 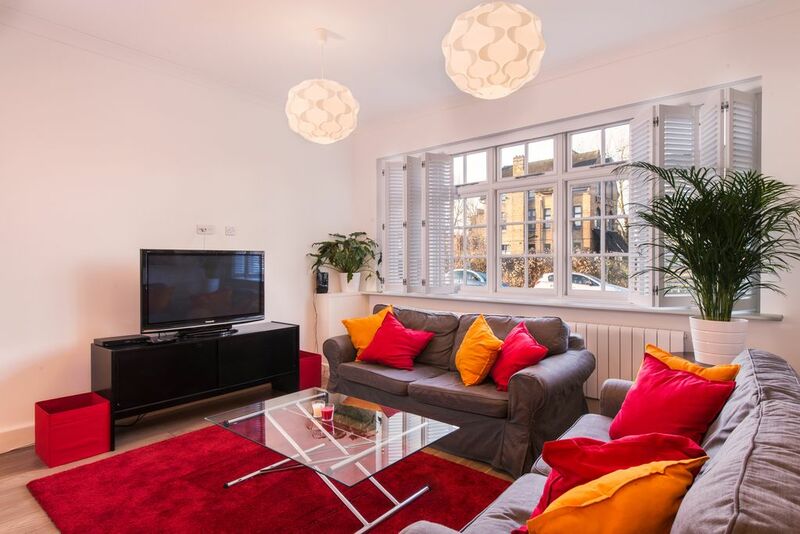 This beautiful house is situated in the upmarket area of Chiswick in West London and has excellent road, rail and bus connections for ease of access around London. The house is 20 minutes from London Heathrow airport and 5 kms to Kensington and Chelsea and 10 kms to the West End of Central London. The house is 250m from Chiswick main line station with trains every 15 minutes to the West End Central and the City of London. This will get you anywhere into Central London / Oxford Street within 30 - 40 minutes. The train also goes to Putney (7 mins) high street where there is a large shopping area. There is a very good convenience store at the end of the road which stays open until 10pm. Chiswick high street with it large shopping area is a 15 minute walk away or 5 minutes by bus. The shoppertainment complex of Westfield Shopping Mall at Sheppard's Bush is also close by with its 1,65 million square feet ( 165,000m2) of shopping, restaurants, cinemas and other leisure activities plus extensive parking. The house has excellent road access to the A4/M4/M25 as well as the A316 to Richmond / M3.